This morning, enjoy an orientation tour of Calgary before heading to Lake Louise. Take a leisurely GUIDED WALK along the lake and hear about the area’s first settlers, some of the unique characters, and the history of this incredible setting. The rest of the day is at leisure. Enjoy a canoe excursion, stroll along the lake, or just relax at this historic Canadian resort. Head north on Icefields Parkway to savor stunning vistas of alpine meadows, waterfalls, and glaciers. 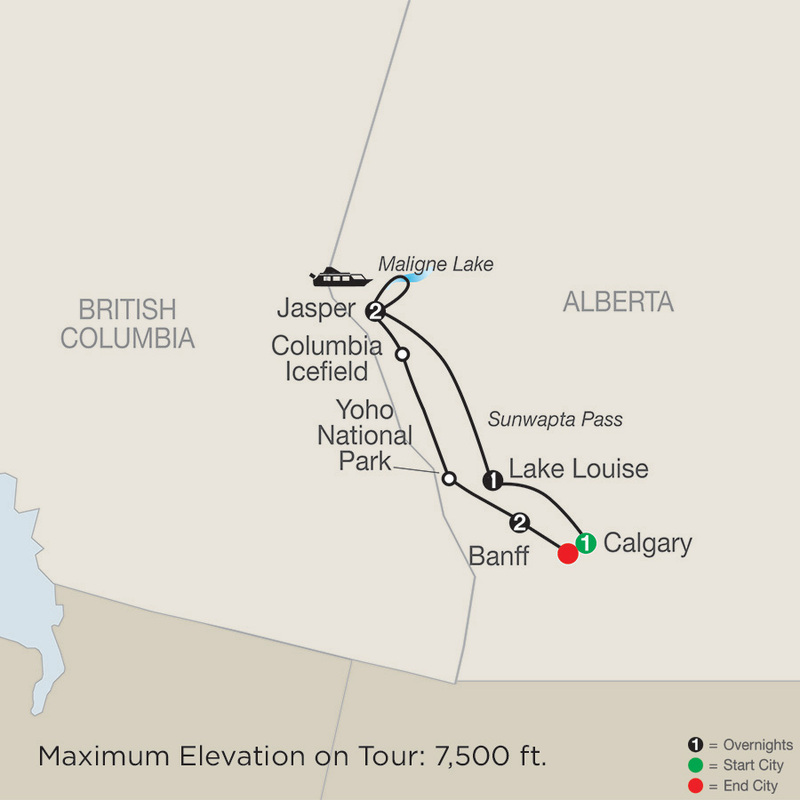 Then, on to JASPER NATIONAL PARK, the largest national park in the Canadian Rockies, with the remainder of your day at leisure. This morning, CRUISE on Maligne Lake. The balance of the day is at leisure, so enjoy your resort. Hollywood greats such as Marilyn Monroe, Robert Mitchum, and Bing Crosby were known to play a round of golf on this scenic course—and you can, too. Pamper yourself with a spa treatment or stroll the streets of Jasper with its array of specialty stores. This morning, we stop at thundering Athabasca Falls before continuing onto the Columbia Icefield, a trip highlight, for a memorable ride on an ICE EXPLORER. Stand on 750 feet of ice and come face to face with the glaciers that feed into a Triple Continental Divide. 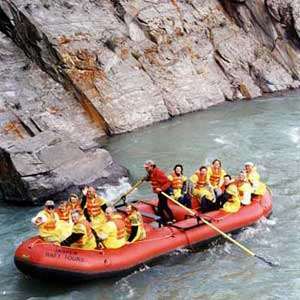 Then, continue our sightseeing with visits to BANFF and YOHO NATIONAL PARK. 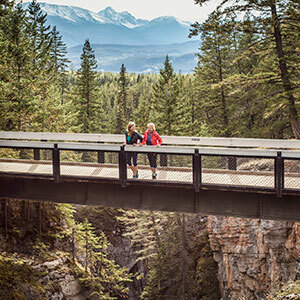 See the Natural Bridge spanning Kicking Horse River and Emerald Lake. Arrive in Banff and enjoy sightseeing including a scenic drive around Tunnel Mountain–watch for animals like elk and deer and unique landscape features like the Bow River and Falls. 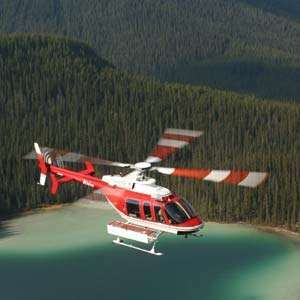 This morning, take advantage of an optional helicopter flightseeing trip with dramatic aerial views of the Rocky Mountains and Banff, or stroll the town’s colorful streets. 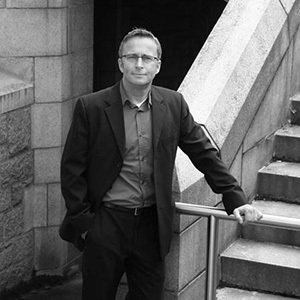 This evening, meet a CANADIAN MOUNTIE who will share stories and the history of the Royal Canadian Mounted Police (RCMP). There will be time for questions and answers before a chance at some great photo ops! Then, your Tour Director hosts a special farewell dinner—the perfect finale for your vacation! Your journey comes to a close today as you arrive at Calgary International Airport for your flight home. Flights should be scheduled after 1 pm. 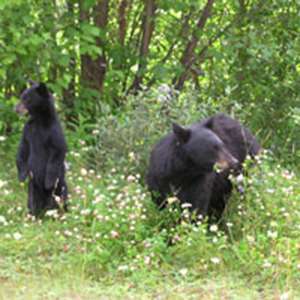 Jasper is well known for its wildlife viewing opportunities and this tour will provide the best chance to see and photograph Rocky Mountain wildlife in the evening when animal sightings are more frequent.